Base Lake, FamCamp, and Boat House closed until further notice. Must be DoD ID card holder in order to access Base Lake and facilities. 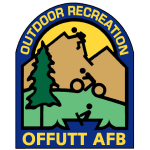 The Offutt Base Lake Recreation Area is located on 183 acres east of Offutt. Facilities include: large indoor pavilion available for parties and special events, covered picnic shelters, disc golf course, archery range, sand volleyball courts, basketball court, horseshoe pits, and two playgrounds. There are 40 RV campsites with full utility hook-ups in the family camping area (FamCamp) and tent camping areas are available around the park. The lake is stocked with a variety of fish, but make sure you comply with Nebraska fishing laws before casting.